carte blanche Editor-in-Chief Klara du Plessis recently spoke to Liz Howard, judge of the 2017 carte blanche 3Macs Prize and author of the Griffin Poetry Prize-winning Infinite Citizen of the Shaking Tent. Among other things, Klara and Liz discuss translation, the construction of the self, and navigating the contemporary literary landscape. KdP: First of all, thank you for agreeing to be the 2017 carte blanche 3 Macs judge! I read Infinite Citizen of the Shaking Tent cover-to-cover when it was released a few years ago, and have now been rereading some of my favourite poems, and the reading experience has been breathtaking both times. There is an intelligence to the poems that is both contemporary and timeless, larger than life, larger than poetry, in the most prepossessing language. “Thinktent” is one of my favourite poems or series of poems (part of which can also be read here). Involuntarily, for me, it conjures “think tank,” which has a corporate ring to it, but is transformed here into a poetic, collective mode of thinking: “a congress / of selves a vibrational chorus.” I’m curious whether you could talk about the poetic construction of self in this poem or in the book as a whole, a self which also includes multitudes, shadows, ancestors…and which seems to layer toward the identity of an “infinite citizen”? LH: That is very kind of you to say and I’m humbled by your intellectually generous inquiry into how selfhood operates in my work. Your intuition is correct that the title is (in part) a play on the term “think tank.” That phrase has always evoked for me a sense of militaristic containment, something I couldn’t see a generative or convivial mode of thinking taking place in. And there is also this notion that the self is the operation who thinks or who is the thinking itself (i.e. Descartes cogito). I experience this notion as a foundational element of the Western thinking tradition. That’s the Enlightenment’s “I” which preceded the Uncertain Eye, that Eye which I thought of as fomenting the probability field of selfhood we encounter in modernity; that searching “I” in suspension (as a silt in fluid) within much of the contemporary poetry that I love. Simultaneously, however, I was attempting to decolonize my thinking. I began to read works on Anishinaabe cosmology and practices of knowledge gathering. 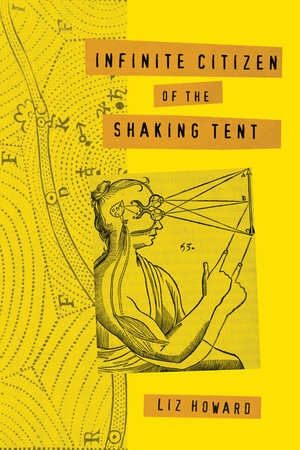 I learned about the rite of the Shaking Tent (Jiisakiiwin) in which a conjurer enters a tent of specific construction and purpose in order to receive messages or prophesy from the beyond-human-world. A central component of the rite is the presence of Mikinaak, a turtle spirit who translates the various spirit world messages into Anishinaabemowin (Ojibway) so that the conjurer can impart the called upon knowledge to the community. Since I am a product of the assimilative program that is the fundamental underpinning of the program known as Canada, myself being “mixed” to the extent that what is left of my indigenous descent has become almost entirely whitewashed in me, which due to the cascading effects of the Indian Act, abuse and addiction I was estranged from the First Nation side of my family, I have never myself had the opportunity to witness the rite firsthand or even consult with an elder about it. I began to wonder if I could use poetic practice as a kind of Shaking Tent, a vehicle of inquiry within my generative, if contaminated, mind-body. I began to see my skull as not only a kind of think “tank” – what keeps the brain matter in and protected – but also the organ that it is; one that receives from without all the sensory data from the world, that sense material the brain is said to transform into a way to know the world and itself also. In this way poetry and self-in-poetry became a constructive and continuously reconstructive constituent of my compositional world; a work that might be a durational experimentation whose repercussions might continue on into the conjectured “infinities.” And I thought, what sort of citizenship can be found there? It’s a question I ask the reader as much as myself. I suppose this might be a “mongrel” way of thinking. In the book itself the self/subject is often splitting apart, becoming many selves. Poet and theorist Denise Riley has this excellent book: Am I That Name? : Feminism and the Category of Women In History. What is there in any given name, any selfhood, that would make one sign for it? Perhaps my aim was always to trouble the ambient uncertainty of who any one really is, if only by way of making for myself a future friend. KdP: You supply an Anishinaabemowin Glossary to some words used in Infinite Citizen. I have a multilingual collection forthcoming and found it challenging to provide translations that straddle the literal and evocative. What was your experience translating language and culture into English, or how did you approach it? 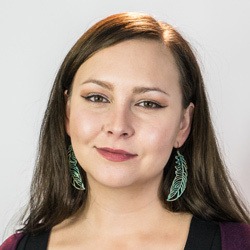 LH: I started teaching myself Anishinaabemowin in a piecemeal fashion several years ago and experimented with incorporating that language into my work. I’ve only recently learned that my paternal grandmother had a working knowledge of it. I feel at a multiple loss that I was never able to connect with her while she was living, so I never truly was able to know her or have the opportunity to learn the language from her. In writing my book I always held the idea of Mikinaak, the translator, poet as translator of raw, dynamical, emotive experience, in my mind, the duality expressed in this vision in concert with my work in the English language. The language within some of my ancestry set about oppressing, was party to/inheritor of that oppression of another lineage of my ancestry. It’s conjectured erasure. I have had to come to terms with the fact of English being one of the colonizer’s tongues; that I am both colonizer and colonized within it. How to come to grips with that knowledge? What would it mean to loosen that grip? These are two of the persistent questions. KdP: I’m not asking what’s next. But beyond the scope of Infinite Citizen, what is your current relationship to words? LH: I’m working on another book tentatively titled Letters in a Bruised Cosmos in which I attempt to deal intimately with what I call “the deeply, darkly personal.” In this work I am intentionally trying to write to a You. I am working with traumas and slippages, multiplicities of time – really a continuing of some of the themes of my first book but telling it perhaps more “close” than “slant.” I also have something in the works that I’ll call The Prose-y Strangeness. It might be a novel but probably not. Ask me about it in seven years. KdP: It feels important to be part of a healthy literary ecology, to coexist with writers who don’t necessarily have a shared vision, but who are attentive and exhilarating in their independent work. So-called CanLit can come across as fractured. Could you comment on your experience of the contemporary literary scene, the ups and downs or plateaus of it? LH: I have been responding to these questions in longhand in my notebook and at this time of transcription I have found that I’ve failed to answer this question. A “slip.” In the first couple of years that I began performing and writing publically I found a good number of people who were supportive. I “came up” in an experimental feminist community. I also had a really hard time being published. I had experiences of indifference, contempt, and abusive behaviour by male poets who were older and more accomplished. Out of a desire to “take it over” (Patti Smith) my good friend and sister poet, Shannon Maguire, and I created and curated our own series, AvantGarden, that foregrounded experimental/in progress/cross-genre work by women. We made our own CanLit community for a time. Then I got into an MFA. By the time I was out of it the larger community seemed primed to hear what I had always been saying. Even now I am at a loss to understand any of it. KdP: carte blanche’s 3 Macs Prize includes nominations across genres (poetry, fiction, creative non-fiction, comics and translation). Who are some writers, from different genres, who currently excite you? And why? LH: I am most excited by work that makes me feel seen and challenged at the same time. Uncanny affinities that can get one’s hackles up in a pseudo-familial way. A sense of objection that for me is cousin to falling in love. I have felt this while reading Chris Kraus and Claudia Rankine and Leanne Betasamosake Simpson and Maggie Nelson and Renee Gladman and Gloria Anzaldúa and Kathy Acker. I have also been compelled by the work of other “young” writers who I guess are my peers: the work of Cecelia Corrigan, Joni Murphy, Jenny Zhang, and Jen George. Excitement filters in when I can feel another’s charge penetrating whatever cognitive enclosure I might find myself pressed up against and looking for a way out. Liz Howard’s Infinite Citizen of the Shaking Tent won the 2016 Griffin Poetry Prize, the first time the prize has been awarded to a debut collection. It was also a finalist for the 2015 Governor General’s Award for Poetry and received an honourable mention for the Alanna Bondar Memorial Book Prize. Howard received an Honours Bachelor of Science with High Distinction from the University of Toronto, and an MFA in Creative Writing through the University of Guelph.